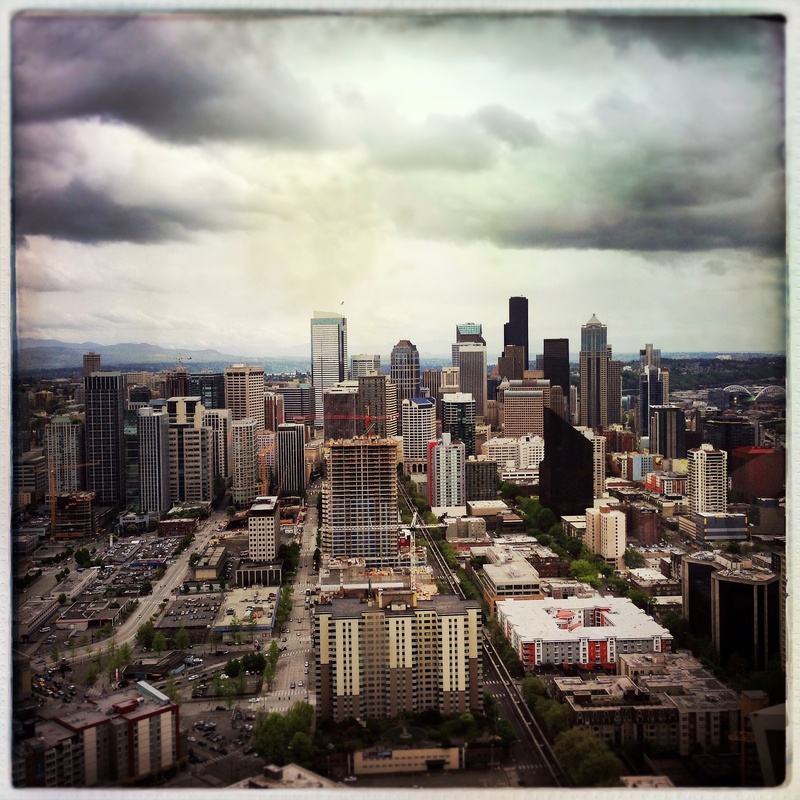 For the 1:00 pm entry in my new 1 Day 1 World Project I have this stormy view of Seattle taken from our Sky City table at the top of the Space Needle. The restaurant makes a complete 360 degree rotation every 47 minutes and John, Ryan and I recently spent a fantastic 2 1/2 hours celebrating Ryan’s birthday while enjoying the incredible views. You might remember we spent Ryan’s actual 13th birthday giving away free books as part of World Book Night 2014 and even though he was incredibly generous with his special day I promised we would plan something fun later that was all about him. Well, this lunch was definitely in his honor but John and I enjoyed it as much as he did! Our first 1 Day 1 World posts captured noontime moments from Germany, Canada, England, Singapore and the American states of California, Illinois, Oregon, Texas and Washington. If you have a photo or story to share about your 1:00 pm hour I’d love to see it! Please tag your post 1 Day 1 World Project for easy reader searches and/or link your post in a comment below so we can all enjoy your view and together we’ll build a virtual 24 hour day filled with images from around the world. If you’re new to the 1 Day 1 World Project please take a look at my introductory post here. This 1:00 pm post will remain open for new submissions until the end of Saturday, May 17th and a new post for the 2:00 pm hour will open for entries Sunday, May 18th. A perfect venue for a birthday party 🙂 Happy belated birthday to Ryan! What a spectacular view! If I ever make it to Seattle, I will go there for lunch, toll! For all my many, many trips to Seattle, I never made it up the Space Needle. Thanks for this great view! 1:00 – 2:00: wet, scrape, wet scrape, wallpaper backing slowly gives way. What a fantastic image Lisa. I shall have to have lunch there too. Is it expensive? I’m glad you like the photo, Jude! The restaurant is a little pricey but it includes a trip up in the glass elevator and the chance to relax while watching the view is pretty wonderful. To save a little though you can always purchase an elevator ticket and walk around the observation deck (outside!) which is right above the restaurant. There is a cafe here too for snacks and drinks. 🙂 I’m looking forward to seeing your Spring Festival photos! Very cool project idea and great photo to start with. Thanks, Paul. I’m glad you like it! Magnificent view of Seattle, Lisa! I love those rotating high rise restaurants! We went to the Spinnaker Room in Cambridge quite often for special occasions. Such a wonderful view of the Charles and Boston, and a memorable location for birthdays, holidays etc! I really MUST get up to your neck of the woods..Seattle looks wonderful! Have you always lived in the Pacific NW? The Spinnaker Room sounds like a great place for celebrations! Yes, I’ve always lived in the Pacific NW and even though I like to travel I really look forward to coming home. 🙂 If you make it up this way I think you’d enjoy your trip! Here is my entry, Lisa. Hope you like it. I love it Amy, thanks so much for joining us! I will follow of course! Happy Sky high birthday to Ryan! I have never seen Seattle and what a view! Would you please send me the link? I have all alerts turned off during this transition time? Thanks! I think I saw this in passing and hadn’t a clue what was going on, Lisa 🙂 I just saw Amy’s entry and was minded to check so I’m off to your first post. Hi Lisa, I’m leaving for Spain this weekend, will miss a couple of the “1 day 1 world”. A week away sounds really nice, I hope you had a great time! Thanks for sharing your 1:00 hour with us!